Hey! If you have followed us for a while, you would know that I absolutely love Bow Wow Boutique products, both their collars and the ID tags that they import in. They offer an amazing range of different patterns on their collars and leashes, and everything is of such a high quality. 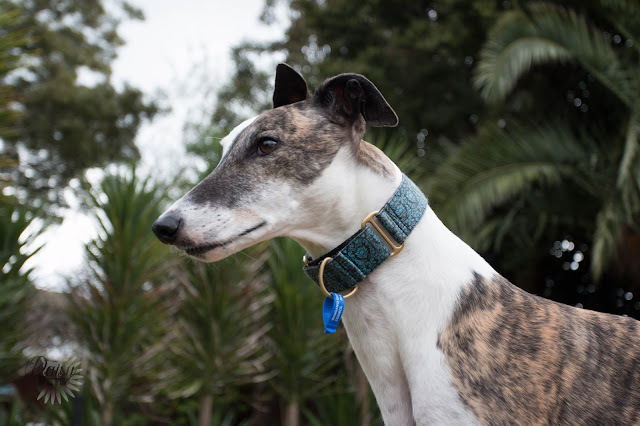 I didn't really know how good quality they were until I compared a collar I purchased from Bow Wow Boutique when mum first adopted to Chico, to the one my mum bought from another brand at the same time. Both collars are of a similar Martingale design, with a thicker fabric backing with a colourful and more appealing ribbon on the outside. On Martingales there are no buckles, but all hardware is metal. Funnily enough, I purchased the Bow Wow Boutique collar as a surprise, and we both chose quite similar collars in blue shades without consulting each other.